Disney is preparing to reboot “Something Wicked This Way Comes“, their 1983 horror fantasy film. Based on the novel by Ray Bradbury, it follows two boys who learn of a mysterious, traveling carnival, Mr. Dark’s Pandemonium Carnival, that is coming to their town. The movie was Disney’s attempt at getting away from its kiddie fare, but ultimately was a flop at the box office. It has since become a cult classic. The reboot will be much closer to the the original novel, which was darker and more filled out. Seth Grahame-Smith, the best selling author of Pride and Prejudice and Zombies (and Abraham Lincoln, Vampire Hunter) as well as a co-writer on Tim Burton’s Dark Shadows movie, will be making his directorial debut. This sounds like it’s going to be AMAZING! What do you think? Tell us in the comments! 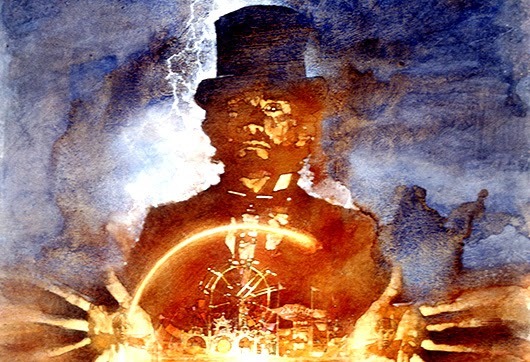 Pick up the original 1983 classic Something Wicked This Way Comes from Amazon!